Do all ROTATOR CUFF problems require surgery? Dr. Austin adjusts (chiropractic) a Foxes player’s shoulder on the sidelines prior to a game. The latest in rotator cuff diagnosis and treatment was covered by Peggy Lamb, LMT from Austin, TX. This included extensive examination of each of the 4 rotator cuff muscles and tendons, common causes of rotator cuff injuries, how ‘shoulder rhythm’ affects the rotator cuff, strategies to prevent shoulder injuries, effective strategies for releasing rotator cuff muscles through therapeutic massage as well as stretching and strengthening exercises for both the rotator cuff and the entire shoulder girdle area. It is not true that all rotator cuff injuries occur in athletes. Dr. Todd and Eugena treat both athletes and non-athletes for many shoulder issues. Todd and Eugena also serve as team trainers and sideline healthcare providers for the semi-pro Springfield Foxes football team. The team just finished the season as the 2012 Eastern Conference Champions of the MidStates Football League. Dr. Todd performing cold laser therapy for a shoulder problem on the sidelines. Remember that ALL shoulder pain has something to do with the rotator cuff (either directly or indirectly). Austin Family Chiropractic’s Patient Exercise Page. 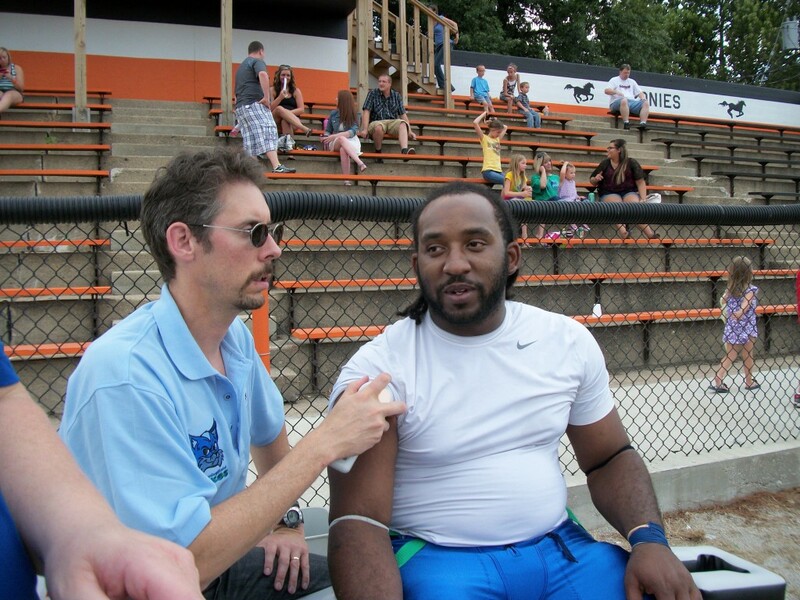 Eugena Austin LMT performing a shoulder massage on a Springfield Foxes player on the sidelines during pregame. cold laser therapy appointment with Dr. Todd, please call (217) 965-3100, send email to draustin@royell.net or visit the clinic website at AFCvirden.com. The clinic can also be found on both Facebook and Twitter. Dr. Todd Austin (left) and Eugena Austin, LMT (right) from Austin Family Chiropractic in Virden recently attended a ‘Releasing the Rotator Cuff’ Seminar in St. Louis. 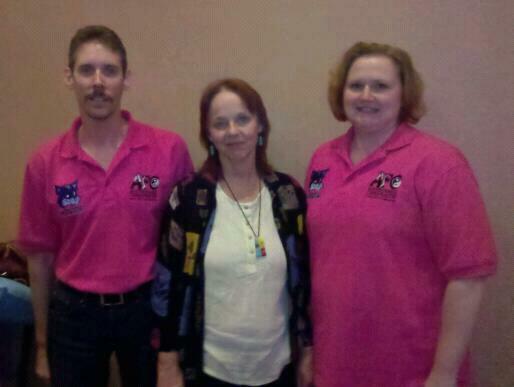 They are seen here with Peggy Lamb, LMT, who is known throughout massage therapy circles as a master at both preventing and treating rotator cuff issues conservatively (ie, without the need for surgery).